Product information "Bar testing kit GAX1000"
Big gold bars (> 100 g) allow you to quickly invest big financial values. However, especially those bars are particularly profitable (victims) for forgers. Gold ingots with small tungsten bars inside have already invaded the market. These inclusions are hard to detect because the ingot's hallmark is mostly original and not damaged. 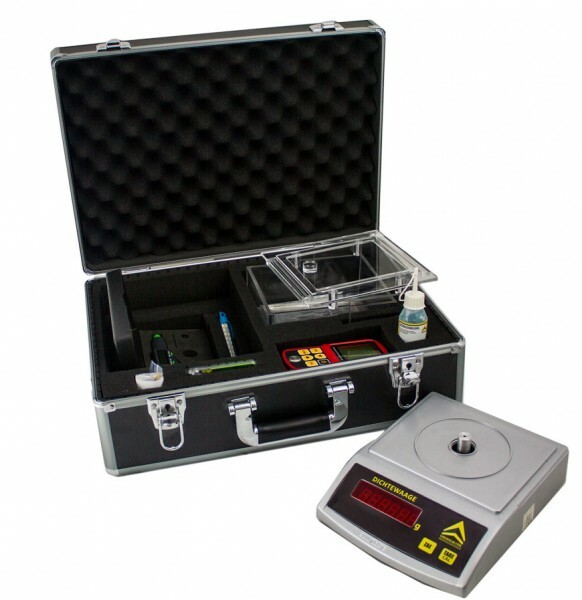 The bar testing kit therefore combines density measurement and ultrasound measurement. The denistiy measurement allows you to detect blatant forgings like e.g. gilded brass bars. When the density is right, the ultrasound testing device will show if the bar is "clean" and exempt from tungsten inclusions. Even silver bars can be tested and "dangerous" lead/tin counterfeits with identical density to silver are certainly detected with the ultrasound. A measurement with both devices is done within about 5 minutes, for experienced users, it will be about 2 to 3 minutes. For buying big gold- and silver bars, this set is ideally suited. Related links to "Bar testing kit GAX1000"
Instruction manual for Goldanalytix Bar testing kit GAX1000 as PDF file. Customer evaluation for "Bar testing kit GAX1000"